July 2017 31 tem. As water evaporates from the water feature, a valve is activated that allows water into the well to a certain level. The Connecticut island project includ - ed a 12-foot surge tank that collects the water if the system is ever turned off. Filters were used on some of the proj - ects while others relied on natural filter- ing such as retention ponds, natural bac- teria and small rocks. Softening the Site According to Matthew Giampietro, "Plantings are key to the success of a stream. Part of the art of rock placement is creating areas for plants - negative spac - es or pockets where plants will grow." Aquatic plants are submerged in a wa - ter feature. Marginal aquatic plants are in- stalled close to the sides. They grow best when their roots are very wet but not to - tally submerged. 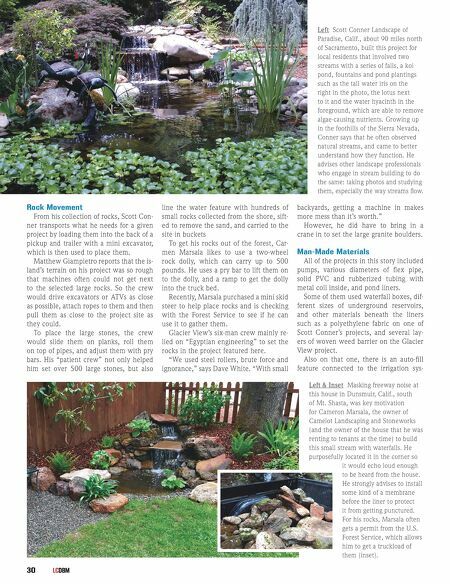 When installing non-aquatic plants near a water feature, Carmen Marsala advises to use root barriers to prevent roots from tearing through liners and into ponds. More Advice from the Pros To help achieve a more organic look, Scott Conner reminds that in natural streams, moss rocks do not have moss growing on them below the water line. "I'm too picky on my stuff," he admits. "I've been known to take something apart if I don't like it. It has to be natural-look - ing and I have to be satisfied." Matthew Giampietro echoes Conner's persistence for precision. "If I put a boul - der down and it doesn't look good from all angles, I'm going to take it out and try another one." He cautions that it's hard to estimate the cost to build water features before - hand and suggests pricing it on a time and materials basis. 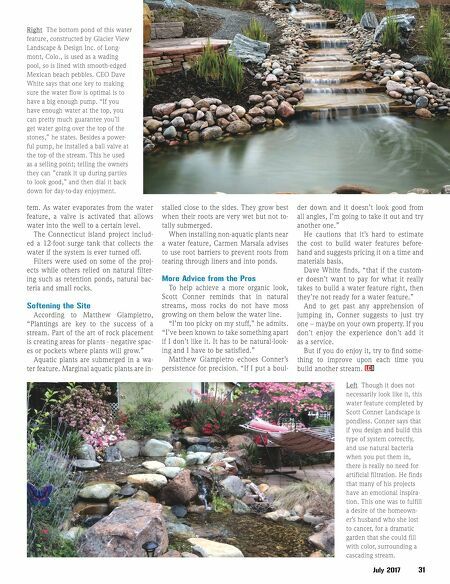 Dave White finds, "that if the custom - er doesn't want to pay for what it really takes to build a water feature right, then they're not ready for a water feature." And to get past any apprehension of jumping in, Conner suggests to just try one – maybe on your own property. If you don't enjoy the experience don't add it as a service. But if you do enjoy it, try to find some - thing to improve upon each time you build another stream. LC DBM Right The bottom pond of this water feature, constructed by Glacier View Landscape & Design Inc. of Long- mont, Colo., is used as a wading pool, so is lined with smooth-edged Mexican beach pebbles. CEO Dave White says that one key to making sure the water flow is optimal is to have a big enough pump. "If you have enough water at the top, you can pretty much guarantee you'll get water going over the top of the stones," he states. Besides a power- ful pump, he installed a ball valve at the top of the stream. This he used as a selling point; telling the owners they can "crank it up during parties to look good," and then dial it back down for day-to-day enjoyment. Left Though it does not necessarily look like it, this water feature completed by Scott Conner Landscape is pondless. Conner says that if you design and build this type of system correctly, and use natural bacteria when you put them in, there is really no need for artificial filtration. He finds that many of his projects have an emotional inspira- tion. This one was to fulfill a desire of the homeown- er's husband who she lost to cancer, for a dramatic garden that she could fill with color, surrounding a cascading stream.